Knowing the nature of things—both the similarities and differences. The design returns to materials research and uses the plant cell structure of trees to explore life’s demand for space. Plywood and LVL are moisture-resistant and eco-friendly building materials. Wood veneer is not a choice anymore; we emphasize the real texture of the materials without too much processing but only an oil polish at the surface. The attitude of coexisting with the Earth is conveyed through the natural materials, bringing more vitality to the space. 1: Zhuangzi is a famous Chinese philosopher, and The Zhuangzi is a compilation of his and others writings. 2 & 3: Scholars at the time. The cell wall of plant cell is a protective and flexible structure responsible for absorption, transportation and secretion of plant tissues. In this design, the grids are a metaphor of the cell wall, connecting outdoor and indoor areas and introducing natural air and sunlight into the house. 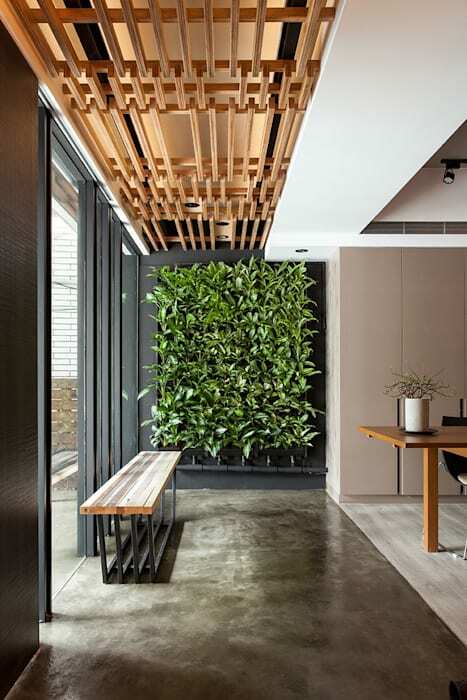 The indoor grids made of LVL extend from the ceiling and become a vertical garden wall, transforming the indoor space into a natural outdoor scene. In this design, the grids are a metaphor of the cell wall, connecting outdoor and indoor areas. Furthermore, as middle lamella is the outermost layer of the cell wall that links the adjacent cells together, the two-sided open bookcase is used to represent as the middle lamella. The semi-transparent bookcase creates an ambiguous atmosphere in the space, bringing the public and private area together but also ensuring their privacy at the same time. The concept that a tree consists of a number of cells is applied to the open bookcase. The plywood shelves with different sizes are regarded as independent cells, piling up to form the entire bookcase. It looks like the middle lamella and cell wall support each other, independent yet closely bonded. The pillars made of old table legs with new paint are solid enough to carry heavy materials and books. The materials are subdivided into different layers and orientations, creating a spatial depth. In this design, plant cells are used as the metaphor to explore the story in the space. With such an innovative idea and non-conventional decorative techniques, the space gets to constantly evolve and further shows the real value of design.